There is 50 single books of 20 matches in one display box. In regards to individual quotation or oversees delivery arrangements please contact us directly, using contact form provided. For trade inquiries, wholesale orders, individual quotation or oversees delivery arrangements please contact us using contact form provided or email us at info@thelegendslondon.com. 5 books, each contains 20 individual astringent matches. FREE SHIPPING WITHIN UK! Natural mineral effect closes pores after shaving creates a barrier similar to traditional aftershaves. Used after shaving, alum matches calm razor burn, soothe and help to keep recently shaved skin in good condition. Antibacterial and disposable for good hygiene. 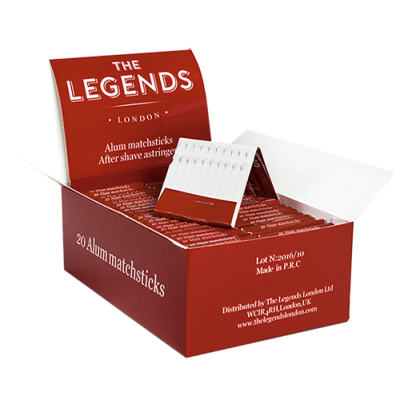 A single book contains 20 individual astringent matches. 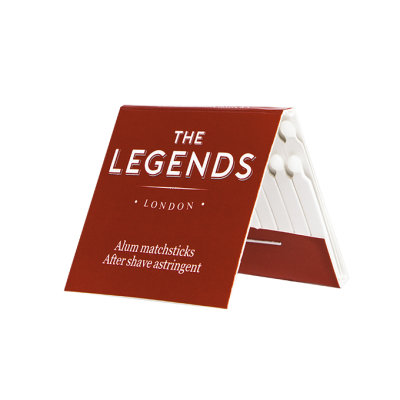 For trade inquiries, wholesale orders, individual quotation or overseas delivery arrangements please contact us using contact form provided or email us at info@thelegendslondon.com. FREE SHIPPING FOR ALL EUROPEAN ORDERS OVER £300. TO PLACE A WHOLESALE ORDER PLEASE CONTACT US DIRECTLY. 220ml jar of our maximum hold hair gel. Best Value for your hard earned £! High hold, medium shine, water soluble.